Last weekend I had the great opportunity to take three classes taught by Jen Cushman at The Queen’s Ink in Savage, MD. 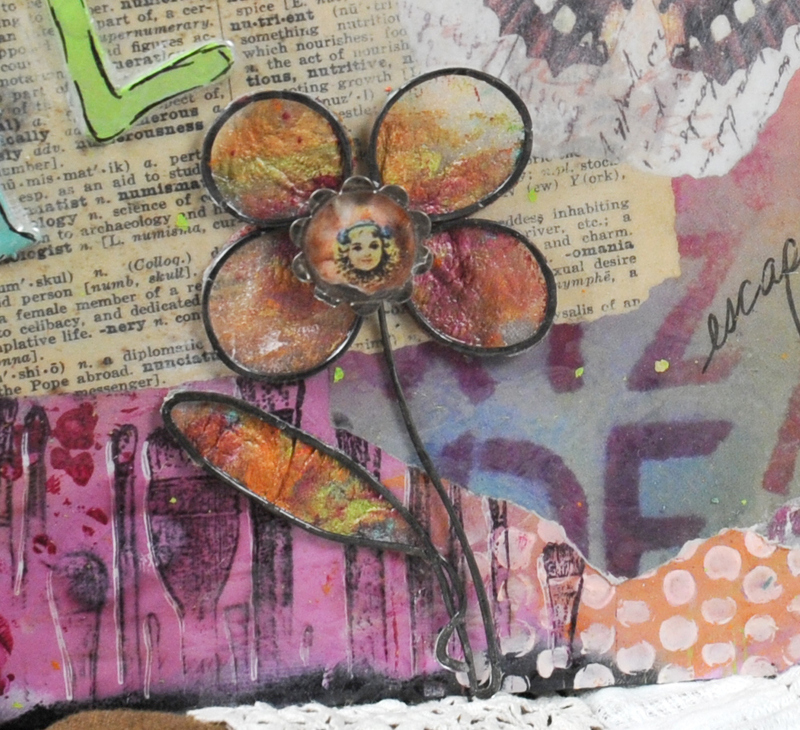 This wonderful shop is a crafter’s paradise – with loads of rubber stamping, paper crafting and mixed media supplies. I have taken some Ice Resin classes with Jen before, but they have all been jewelry focused. This time, two of the classes were art and assemblage creations and I found myself diving into new techniques and loving it. 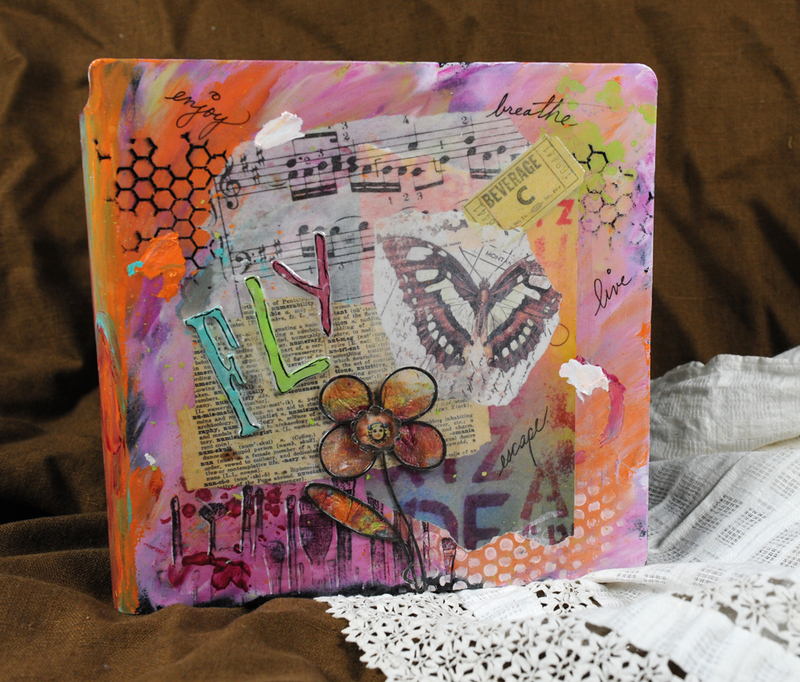 First on Friday night, we created a journal cover, using paints, stamps, collage papers, grunge board letters and pens. She also taught us to create wire embellishments that we attached to the cover as well. When the collage was completed, we coated the entire cover with Ice Resin. Here is a close up of the wire embellishment. We started by using plain paper towels to wipe the paint from our hands – this later became the resin “paper” we attached to the wire form we created. I added a small bezel with a little face in it to the center of the flower. Saturday’s class was a resin heart necklace – I’ve done this type of class before so was more comfortable here. I chose a few bits out of my jewelry stash – a carved wooden bird and a leaf branch – both former pins that had lost their shanks. 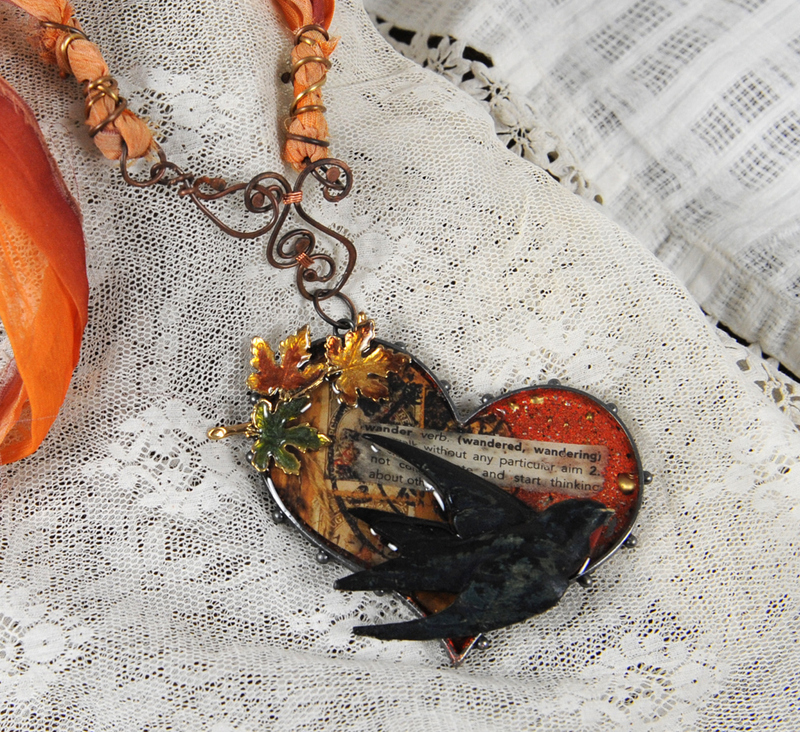 Iced Enamels in torched copper and carnelian were applied to the bezel, then a collage of papers and dictionary words was added. The bezel was filled with Ice Resin and the bird and leaf were carefully set in. After a break for lunch, Jen taught the class to form metal fibers using a torch; to create clasps with wire; and to attach jump rings and the fibers to silk ribbon to complete a necklace. Since the class was full and I had experience with these techniques, I helped out with the instruction, and completed my necklace at home. 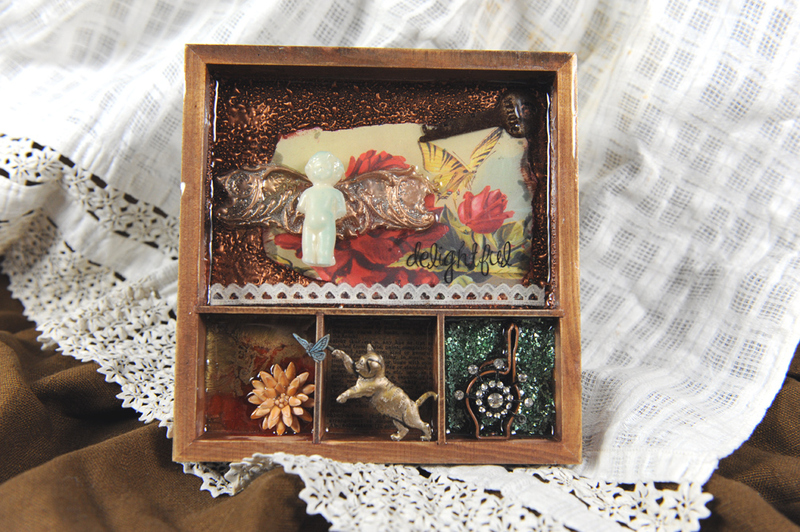 Sunday, we worked on assemblage pieces, learning to use the molding putty to reproduce found objects in resin. Jen also taught techniques for finishing the resin reproductions with paint, Iced Enamels and Gilder’s Paste. Did you know you could use Iced Enamels on cured resin? And on bare wood as well – I used torched copper in the largest section of my box. The resin castings I chose for my piece were a hardware piece and a frozen charlotte. 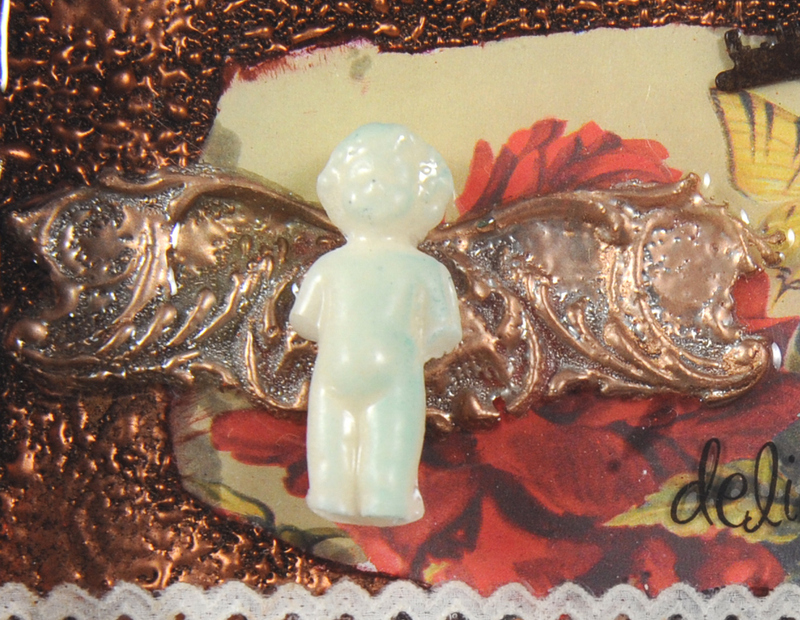 The doll had been cast in white resin, so just a touch of gilder’s paste was added. The hardware piece was given a coat of German Silver Iced Enamels and a touch of celtic bronze gilder’s paste. The bottom sections were done with Iced Resin dripped with alcohol inks and resin tints; some dictionary paper; and resin mixed with glass glitter. 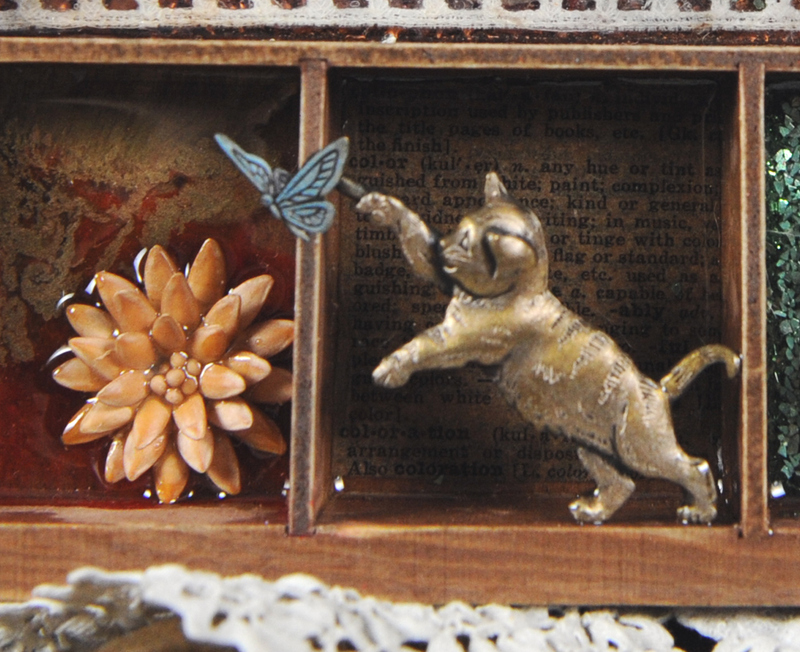 In the center section above the dictionary paper, I mounted a little cat chasing a butterfly pin I had in my stash. I added some gilder’s paste to it as well, to bring out the detail and to make the little butterfly blue. I had such a great time learning from Jen, who is an awesome teacher. I am so excited to have new techniques I can use with Ice Resin and all the Ice Resin family of products. 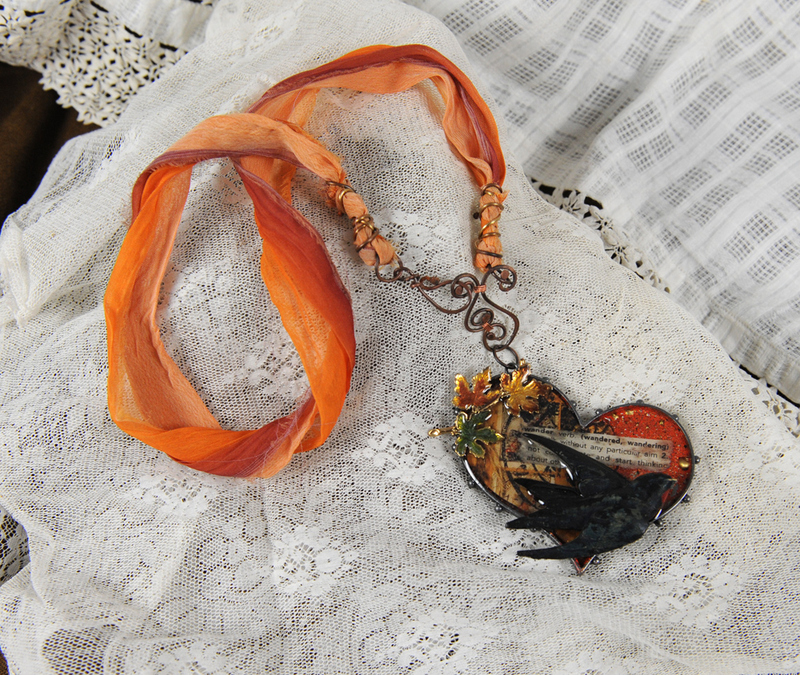 This entry was posted in ice resin and tagged assemblage, ice resin, iced enamels, jewelry, mixed media. Bookmark the permalink. Liz, it was so great to meet you and have you in Jen’s classes. Thank you so much for all of the help and assistance you gave to Jenn. I know she appreciated you taking your time from class to assist her. Hope to see you again in the near future. The pictures on your blog look great.